Be the first to get rid of all 10 of your cards by making words. Each turn, simply start your word with the last card played. Just like the name, WordSpiel. Spiel uses the S from WordS. It’s the word game…Where the END…is just the BEGINNING! Word size doesn’t matter, but ending with a tricky letter can really challenge your opponents. You can use the timer or take your time, just be sure to put your best word forward! Your friends and family will thank you for spreading the WORD about WordSpiel! New word game from the creator of SET, Quiddler, Five Crowns & Karma. 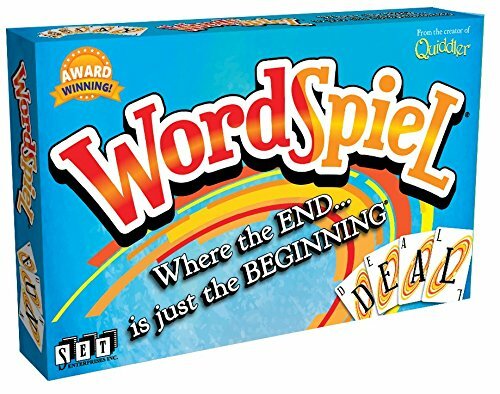 WordSpiel is the game - Where the END...is just the BEGINNING! Each word spins off the last, so the game will never be the same twice! Perfect for family & friends of all ages - kids can compete with adults! Ages 8 to adult 1-6 Players Includes a digital timer. If you have any questions about this product by SET Enterprises, contact us by completing and submitting the form below. If you are looking for a specif part number, please include it with your message.